Palram Gazebo Palermo 4300 Grey: The elegant and fashionable design of this gazebo will provide an all year round addition to your home. 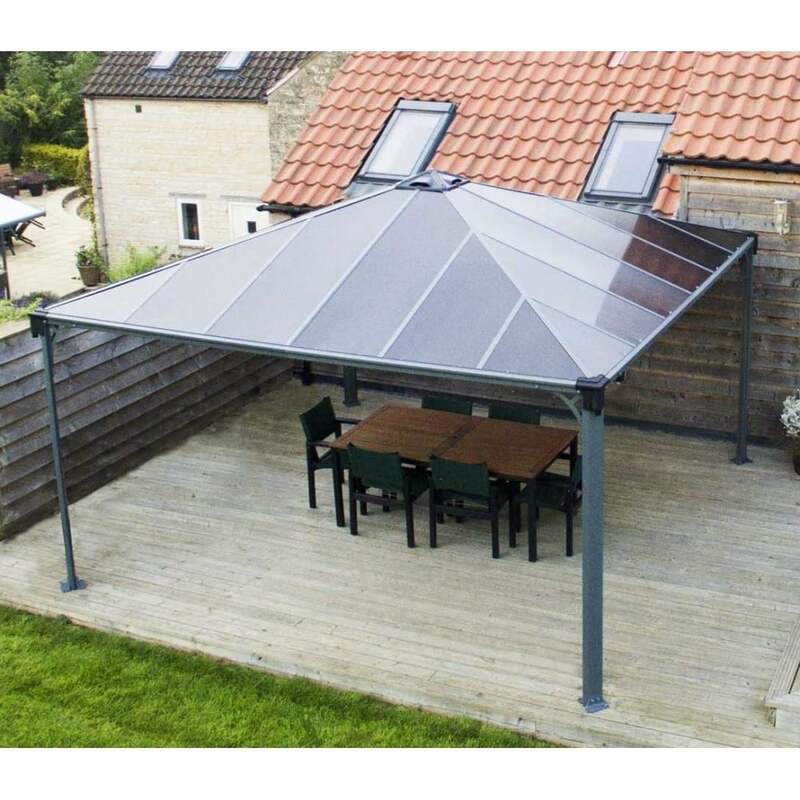 Designed to provide a cool retreat during the hot summer months and providing shelter from the wind and rain during the rest of the year to provide a versatile living space. Polycarbonate roofing panels feature a bronze glazing and the rust resistant powder coated heavy duty aluminium frame includes sturdy aluminium poles and foot pads. The Palermo has a durable structure and can be used to provide shelter for a patio, to cover an outdoor spa or cover a space whne hosting an outdoor dinner party, enabling you to enjoy the fresh air and the view of your garden. Integrated rails and hooks can be used to hang optional curtains, (not supplied) and integrated gutter heads and a decorative wind and spoke escapement provides enhanced air flow through the structure. A 5 year warranty against manufacturing defects is included. Optional 4 Piece Grey Curtain Set is available on our site, Code 704056.